In this exclusive excerpt from the new edition of ‘Wingnuts,’ author John Avlon reminds us that paranoid extremism is nothing new in American politics. If you’re disgusted by the unhinged hyper-partisanship that distorts our political debates beyond reason, here’s some good news—we’ve overcome these forces before. American political history has been marked by periodic eruptions of the “heated exaggeration, suspiciousness, and conspiratorial fantasy” that Richard Hofstadter famously characterized as “the paranoid style in American politics.” Wingnuts have masqueraded under different names and causes at different times, but they have always been committed to an “us against them” framing of domestic debates while inflaming group hatred in the name of politics and alleged principle. They prey on fear and ignorance. Survey Wingnut rhetoric through the ages and the usual suspects keep surfacing: appeals to religious suspicion; ethnic and racial divisions; foreign subversion of sovereignty; and perhaps the oldest conspiracy theory of them all—accusing the president of the United States of being a tyrant and a dictator bent on destroying the Constitution. Even our most beloved and broadly unifying figures were not immune from Wingnuts’ attacks in their time. Conspiracy theories would make their initial mark with such targets as the Freemasons, inspiring an early third party. But the obsession with religious difference that first attached itself to the freethinking Jefferson would manifest itself more thoroughly when combined with fears over early Catholic immigration. In 1852, anti-Catholic anxieties gave rise to the Know-Nothing movement—so named because members were supposed to deny all knowledge of the secret society when asked by saying, “I know nothing.” Their apparent embrace of ignorance did not appear ironic until decades later. Instead, the Know-Nothings were briefly a force to be reckoned with. Their mission was not subtle: The movement’s newspaper, the American Organ explained that the group’s goal was “to resist the insidious policy of the Church of Rome and other foreign influences against the institutions of our country, by placing [in] all offices none but native-born Protestant citizens.” Transforming into a Nativist political party called the American Party, it quickly gained influence by partly filling the void left by the implosion of the Whigs. Within two years, the American Party was ascendant, successfully electing governors in nine states, eight senators and 104 members of the House. Lincoln’s election in 1860 as the first Republican president provoked even more furor. Southern Democrats took the outcome of the election as their cue to spark secession, with Jefferson Davis claiming his Confederates were “upholding the true doctrines of the Federal Constitution” while allies similarly twisted the Bible by conjuring up faith-based defenses of slavery. In the backlash to Reconstruction after the Civil War, the Knights of the Ku Klux Klan were born. Formed by Confederate veterans, members of this terrorist organization fancied themselves noble defenders of a Southern way of life under siege by occupying forces. But the KKK actually reached its apex of influence during the 1920s. Parading under the American flag in marches on Washington and preaching law and order against a backdrop of foreign-associated anarchist bombings that claimed dozens of lives, they also advocated for “100 percent Americanism” in response to the unprecedented wave of immigration from Eastern and Southern Europe. This twentieth-century incarnation of the Klan attracted several million members, and its reach extended far beyond the borders of the former Confederacy, with some of its largest klaverns in Indiana, Illinois, Texas, Ohio, Pennsylvania, and California. Later in the decade, another imperial wizard named Hiram W. Evans took a less strictly racial view of the Klan’s mission, instead pitting “the great mass of Americans of the old pioneer stock” against “intellectually mongrelized ‘Liberals.’” “We are a movement,” Evans wrote, “of the plain people, very weak in the matter of culture, intellectual support, and trained leadership. We are demanding, and we expect to win, a return of power into the hands of the everyday, not highly cultured, not overly intellectualized, but entirely unspoiled and not de-Americanized, average citizen of the old stock.” It was a message of rural real Americans against liberal urban interlopers that repeatedly resurfaces in our politics. The Roaring Twenties also saw heated debates over evolution, most infamously the 1925 Scopes Monkey Trial, which pitted William Jennings Bryan against Clarence Darrow in a Tennessee courtroom, a drama captured in Inherit the Wind and H. L. Mencken’s courtroom dispatches. Bryan, a three-time populist Democrat presidential candidate and Woodrow Wilson’s secretary of state, was the era’s premier spokesman for religious fundamentalism. In 1924, Bryan declared, “All the ills from which America suffers can be traced back to the teaching of evolution. It would be better to destroy every other book ever written, and save just the first three verses of Genesis.” The basic debate between creationism and evolution remains in play decades later. Demagogues always do well during economic downturns, and the Great Depression was a workers’ paradise for Wingnuts on all sides. Louisiana populist Huey Long grabbed power across his home state in the name of making “every man a king” and was planning to run for president against Franklin D. Roosevelt from the left before being gunned down at the mammoth state capitol building he had constructed. One of Long’s disciples and a founder of the “Share Our Wealth Society” was a preacher named Gerald L. K. Smith. He swung from the left to the right, first forming the isolationist America First Party and then the Christian Nationalist ticket to run for president while proclaiming the virtues of anti-Semitism in the pages of his newspaper, The Cross and the Flag. This epic rant boasts all the Wingnut heraldry—the unveiling of a great conspiracy by evil imposters to weaken America from within, diluting our stock, sapping our resolve, and making us vulnerable to enemies who are hell-bent on destroying our way of life. And of course the sinister conspiracy goes straight to the top of the opposing party in power, in this case George C. Marshall, the general who did more than any other to prepare America to win World War II and subsequently secure the peace. Because McCarthy eventually imploded (as all Wingnuts do), it is tempting to dismiss him as a grubby, loudmouthed bully whose bark was worse than his bite. But in his heyday, no public poll showed him with less than 34 percent support among the American public. McCarthy’s mantle was picked up by groups such as the John Birch Society, whose founder Robert Welch fully embraced whacked-out theories of Red subversion and attacked President Eisenhower as “a dedicated, conscious agent of the Communist conspiracy.” Arguing that “Moscow and Washington are, and for many years have been, but two hands of one body controlled by one brain,” Welch warned of a secret plan to create a worldwide police state controlled by the Kremlin. He built out his network through such policy initiatives as “Get the US out of the UN,” and “No to Gun Control,” as well as such satellite single-issue groups as the Movement to Restore Decency. Anyone considered insufficiently anti-Communist was deemed a “comsymp”—short for Communist sympathizer. The godfather of modern conservatism, William F. Buckley Jr., denounced the Birchers as “damaging to the cause of anti-communism” in the pages of his National Review magazine. Conservative author Russell Kirk noted: “Cry wolf often enough and everyone takes you for an imbecile or a knave, when after all there are wolves in this world.” Bob Dylan even took the Birchers to task in his folk tune “Talking John Birch Paranoid Blues.” The discredited organization still endures today, having moved its headquarters to Joe McCarthy’s hometown of Appleton, Wisconsin. Old anti-Catholic riffs reemerged during the 1960 campaign as John F. Kennedy aimed for the presidency. In Texas, the Baptist convention passed a resolution “cautioning members against voting for a Roman Catholic candidate”—buoyed by the old argument that a Catholic president would put loyalty to the pope ahead of loyalty to the United States. Just weeks after his election, a virulently anti-Catholic retired postal worker tried to assassinate JFK in Florida. The late 1960s proved to be the most civically unstable since the 1860s. Culture wars erupted as nonviolent protests were replaced by race riots, and peaceful antiwar activists were eclipsed by hundreds of shootings, arsons, and bombings attributed to left-wing radical groups like the Weather Underground and the Black Panthers. The backlash brought Richard Nixon and the Republicans into the White House on a message of law and order that would twist into the horrific abuse of power scandals surrounding Watergate, further decreasing trust in government. The scars of the era’s excesses would be carried forward by the baby boomers’ fractious political debates—pitting crew cuts against the longhairs—well into the opening years of the twenty-first century. In the long journey from frontier expansion to landing on the moon, there are clear common undercurrents to the paranoid politics advanced by the Wingnuts during different eras in America. Against this backdrop it’s easy to see the patterns in our recent history, where the angry impulse to delegitimize duly elected presidents of the United States leads to irrational hatreds and cynical posturing. But for some folks, there is a temptation to look at this twisted American history and then use it to rationalize away the unhinged excesses of our own times. The more self-congratulatory among them might be tempted to compare their feuds favorably to the founding fathers’ ugliest partisan fights, providing both benediction and absolution for any hate they might hurl at opponents. But that self-serving spin obscures the real lesson: Today’s unhinged hyper-partisans are not likely to look any better or wiser in the rearview mirror than the Wingnuts of our past. Instead, they will be at best a stale and bitter punchline of our times and then fade, unloved, into obscurity. 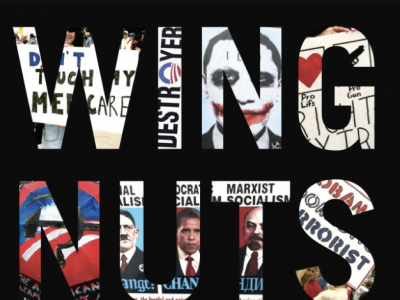 Excerpted from the newly revised edition of Wingnuts, by John Avlon, published by Beast Books. Copyright 2014. This entry was posted in Columns, Featured Columns and tagged Wingnuts. Bookmark the permalink.